A sealed canister, commonly filled with silica gel and other molecular sieves used as desiccant in drug containers to keep contents dry. A molecular sieve is a material with pores (very small holes) of uniform size. These pore diameters are similar in size to small molecules, and thus large molecules cannot enter or be adsorbed, while smaller molecules can. As a mixture of molecules migrate through the stationary bed of porous, semi-solid substance referred to as a sieve (or matrix), the components of highest molecular weight (which are unable to pass into the molecular pores) leave the bed first, followed by successively smaller molecules. 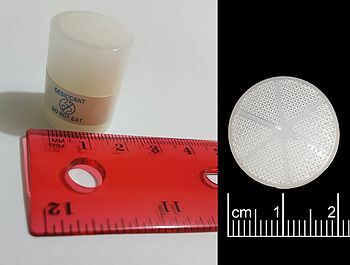 Some molecular sieves are used in chromatography, a separation technique that sorts molecules based on their size. Other molecular sieves are used as desiccants (some examples include activated charcoal and silica gel). Molecular sieves are often utilized in the petroleum industry, especially for drying gas streams. For example, in the liquid natural gas (LNG) industry, the water content of the gas needs to be reduced to less than 1 ppmv to prevent blockages caused by ice. In the laboratory, molecular sieves are used to dry solvent. "Sieves" have proven to be superior to traditional drying techniques, which often employ aggressive desiccants. Under the term zeolites, molecular sieves are used for a wide range of catalytic applications. They catalyze isomerisation, alkylation, and epoxidation, and are used in large scale industrial processes, including hydrocracking and fluid catalytic cracking. They are also used in the filtration of air supplies for breathing apparatus, for example those used by scuba divers and firefighters. In such applications, air is supplied by an air compressor and is passed through a cartridge filter which, depending on the application, is filled with molecular sieve and/or activated carbon, finally being used to charge breathing air tanks. Such filtration can remove particulates and compressor exhaust products from the breathing air supply. The U.S. FDA has as of April 1, 2012 approved sodium aluminosilicate for direct contact with consumable items under 21 CFR 182.2727. Prior to this approval Europe had used molecular sieves with pharmaceuticals and independent testing suggested that molecular sieves meet all government requirements but the industry had been unwilling to fund the expensive testing required for government approval. Methods for regeneration of molecular sieves include pressure change (as in oxygen concentrators), heating and purging with a carrier gas (as when used in ethanol dehydration), or heating under high vacuum. Regeneration temperatures range from 175 °C to 315 °C depending on molecular sieve type. In contrast, silica gel can be regenerated by heating it in a regular oven to 120 °C (250 °F) for two hours. However, some types of silica gel will "pop" when exposed to enough water. This is caused by breakage of the silica spheres when contacting the water. 3Å molecular sieves do not adsorb molecules whose diameters are larger than 3 Å. The characteristics of these molecular sieves include fast adsorption speed, frequent regeneration ability, good crushing resistance and pollution resistance. These features can improve both the efficiency and lifetime of the sieve. 3Å molecular sieves are the necessary desiccant in petroleum and chemical industries for refining oil, polymerization, and chemical gas-liquid depth drying. 3Å molecular sieves are used to dry a range of materials, such as ethanol, air, refrigerants, natural gas and unsaturated hydrocarbons. The latter include cracking gas, acetylene, ethylene, propylene and butadiene. 3Å molecular sieve is utilized to remove water from ethanol, which can later be used directly as a bio-fuel or indirectly to produce various products such as chemicals, foods, pharmaceuticals, and more. Since normal distillation cannot remove all the water (an undesirable byproduct from ethanol production) from ethanol process streams due to the formation of an azeotrope at around 95 percent concentration, molecular sieve beads are used to separate ethanol and water on a molecular level by adsorbing the water into the beads and allowing the ethanol to pass freely. Once the beads are full of water, temperature or pressure can be manipulated, allowing the water to be released from the molecular sieve beads. 3Å molecular sieves are stored at room temperature, with a relative humidity not more than 90%. They are sealed under reduced pressure, being kept away from water, acids and alkalis. 4Å molecular sieves are widely used to dry laboratory solvents. They can absorb water and other molecules with a critical diameter less than 4 Å such as NH3, H2S, SO2, CO2, C2H5OH, C2H6, and C2H4. It is widely used in the drying, refining and purification of liquids and gases (such as the preparation of argon). Bottle of 4Å molecular sieves. These molecular sieves are used to assist detergents as they can produce demineralized water through calcium ion exchange, remove and prevent the deposition of dirt. They are widely used to replace phosphorus. The 4Å molecular sieve plays a major role to replace sodium tripolyphosphate as detergent auxiliary in order to mitigate the environmental impact of the detergent. It also can be used as a soap forming agent and in toothpaste. 4Å molecular sieves can purify sewage of cationic species such as ammonium ions, Pb2+, Cu2+, Zn2+ and Cd2+. Due to the high selectivity for NH4+ they have been successfully applied in the field to combat eutrophication and other effects in waterways due to excessive ammonium ions. 4Å molecular sieves have also been used to remove heavy metal ions present in water due to industrial activities. The metallurgical industry - separating agent, separation, extraction of brine potassium, rubidium, caesium, etc. Medicine - load silver zeolite antibacterial agent. 5Å molecular sieves are often utilized in the petroleum industry, especially for the purification of gas streams and in the chemistry laboratory for separating compounds and drying reaction starting materials. They contain tiny pores of a precise and uniform size, and are mainly used as an adsorbent for gases and liquids. 5Å molecular sieves are used to dry natural gas, along with performing desulfurization and decarbonation of the gas. They can also be used to separate mixtures of oxygen, nitrogen and hydrogen, and oil-wax n-hydrocarbons from branched and polycyclic hydrocarbons. 5Å molecular sieves are stored at room temperature, with a relative humidity less than 90% in cardboard barrels or carton packaging. The molecular sieves should not be directly exposed to the air and water, acids and alkalis should be avoided. Molecular Sieves are available in different shape and sizes. But the spherical beads have advantage over other shape as they offer lower pressure drop, attrition resistant as they do not have any sharp edges, also have good strength i.e. crush force required per unit area is higher. Certain beaded molecular sieves offer lower heat capacity thus less energy requirement during regeneration. The other advantage of using beaded molecular sieve is bulk density is usually higher than other shape, thus for same adsorption requirement molecular sieve volume required is less. Thus while doing de-bottlenecking you may use beaded molecular sieve and load more adsorbent in same volume and avoid any vessel modifications. ^ "Molecular Sieve Definition - Definition of Molecular Sieve - What Is a Molecular Sieve?". Chemistry.about.com. 2013-12-18. Archived from the original on 2014-02-21. Retrieved 2014-02-26. ^ J. Rouquerol; et al. (1994). "Recommendations for the characterization of porous solids (Technical Report)" (free download pdf). Pure Appl. Chem. 66 (8): 1739–1758. doi:10.1351/pac199466081739. ^ "COATED MOLECULAR SIEVE - Patent application". Faqs.org. 2010-03-18. Retrieved 2014-02-26. ^ "Desiccant Types". SorbentSystems.com. Retrieved 2014-02-26. ^ Mann, B. F.; Mann, A. K. P.; Skrabalak, S. E.; Novotny, M. V. (2013). "Sub 2-μm Macroporous Silica Particles Derivatized for Enhanced Lectin Affinity Enrichment of Glycoproteins". Analytical Chemistry. 85 (3): 1905–1912. doi:10.1021/ac303274w. PMC 3586544. PMID 23278114. ^ Pujadó, P. R.; Rabó, J. A.; Antos, G. J.; Gembicki, S. A. (1992-03-11). "Industrial catalytic applications of molecular sieves". Catalysis Today. 13 (1): 113–141. doi:10.1016/0920-5861(92)80191-O. ^ "Sec. 182.2727 Sodium aluminosilicate". U.S. Food and Drug Administration. 1 April 2012. Retrieved 10 December 2012. ^ "Molecular Sieve Desiccant". DesiccantPacks.net. Retrieved 2014-02-26. ^ a b "Molecular Sieves". Sigma-Aldrich. Retrieved 2014-02-26. ^ "Molecular Sieve,yiyuan Molecular Sieves". Chemicalpackingcorp.com. Retrieved 2014-02-26. ^ "Hengye Inc". Hengye Inc. Hengye Inc. Retrieved 10 July 2015. This page was last edited on 21 March 2019, at 08:45 (UTC).